The Stateless People Of The World Are The Subject Of A New Photography Book : Goats and Soda Greg Constantine has spent 10 years documenting the world's stateless people. 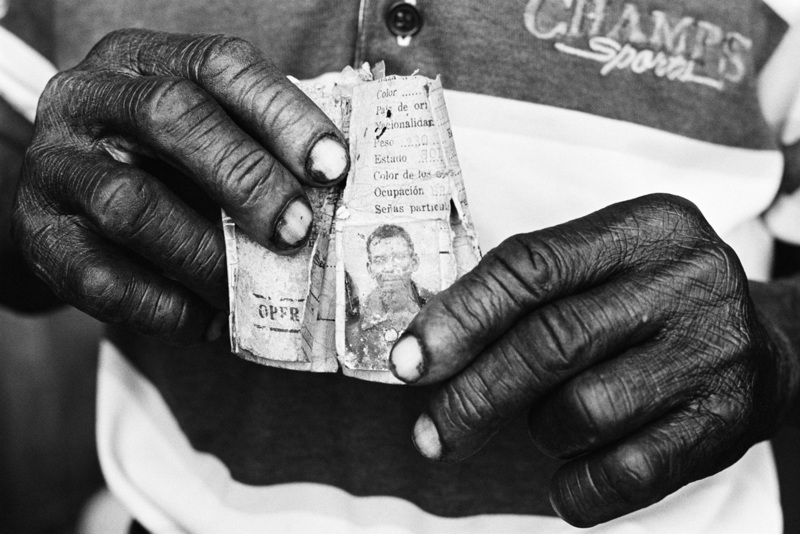 They live without passports, without ID cards, without dignity — but not without hope. A group of Rohingya men who fled Myanmar to seek a better life in Bangladesh now eke out a living as laborers, Constantine says. He photographed them in 2009. It seems like a simple question. But for ten million people around the world, there is no easy answer: They are stateless. They lack basic documents like a passport or a national ID card. And so they may not be able to go to school, hold a job, own land, get health care. Photographer Greg Constantine calls them "Nowhere People" — that's the title of his new book, which documents the daily lives these individuals. 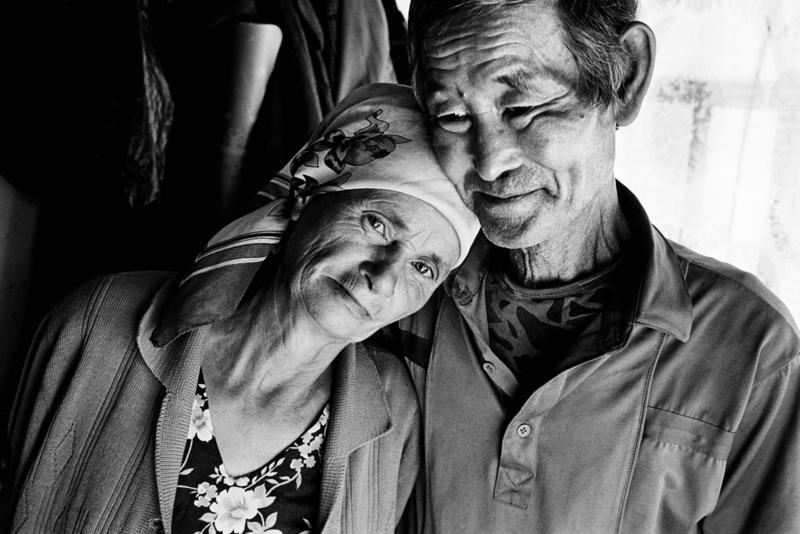 Constantine's first encounter with the world of the stateless came in 2002, when he moved to Japan to teach English and start a photography career. His initial freelance story was about North Korean refugees hiding from authorities in China. Many of the women gave birth to children while living illegally in China. So neither the women nor their children had any legal documents. 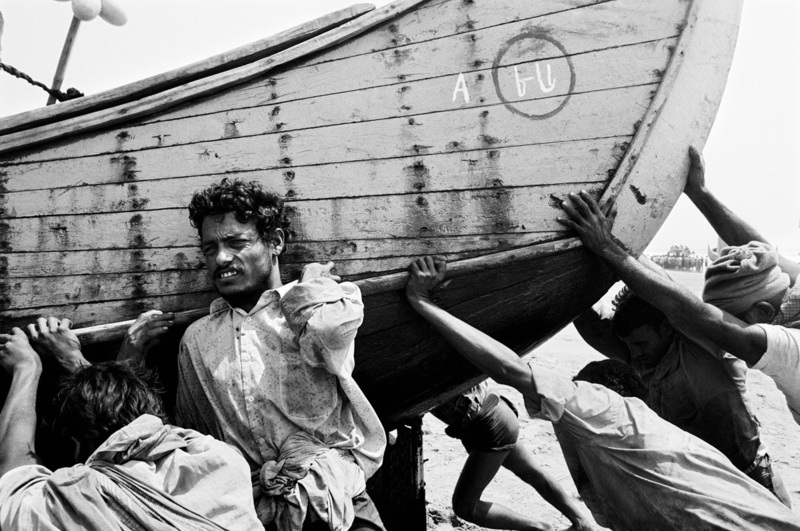 Their uncertain future sparked his decade-long work documenting the lives of the stateless. Since then, he's traveled from Southeast Asia and the Middle East to Africa and Europe to capture in photographs and words the experiences of some of the world's largest communities of stateless people. I spoke with Constantine about this work. The interview has been edited for length and clarity. Handprints of children from the stateless Galjeel community in southeastern Kenya decorate a wall of an abandoned school. Is there one picture that captures what it's like to live as a stateless person? The photograph on the cover of the book says a lot, although it doesn't say it all. The photo was taken in southeastern Kenya in 2008. 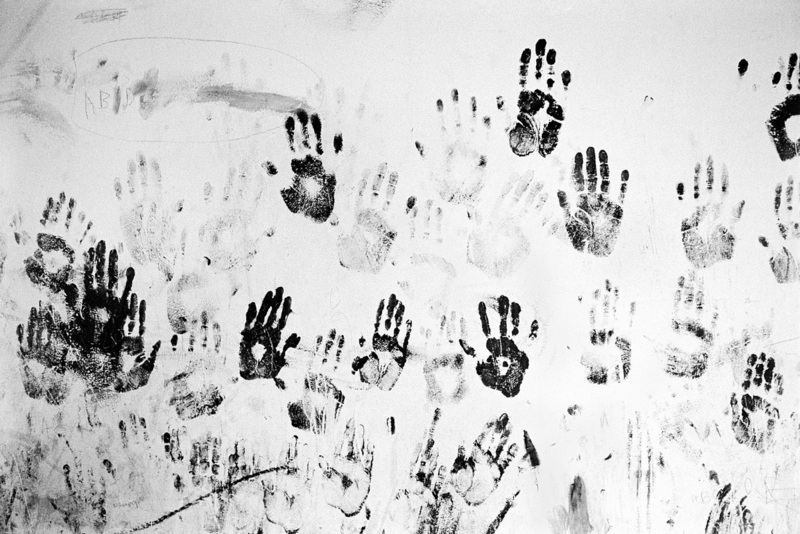 It is a photo of handprints that a group of stateless children had left on a wall of an abandoned school. I shared this photo with a group of fifth grade students in St. Louis a few years ago on a school tour in collaboration with the Pulitzer Center on Crisis Reporting. One student said something to the effect of, "It's like those kids are trapped behind something invisible. You know they are there because of their handprints but you can't see their faces. Its like they are trying to tell the world ... we are here!" An estimated 140,000 Rohingya, a Muslim minority in Myanmar, were displaced from their homes during ethnic violence in 2012. They have been forced to live in internment camps like this one, Constantine says. You've taken many photos of the Rohingya, a Muslim minority in Buddhist-majority Myanmar. What's their life like? The story of the Rohingya is really the most extreme situations of statelessness in the world today, at least in my experience. The 140,000 Rohingya living in camps inside Burma basically live an apartheid-like existence, totally isolated and segregated from the Buddhist community. They can't leave the camps. They can't work. They receive meager humanitarian aid and very little or no access to healthcare. While so many are celebrating the success of the recent elections in Myanmar, and for good reason, an ethnic cleansing is taking place at the same time. 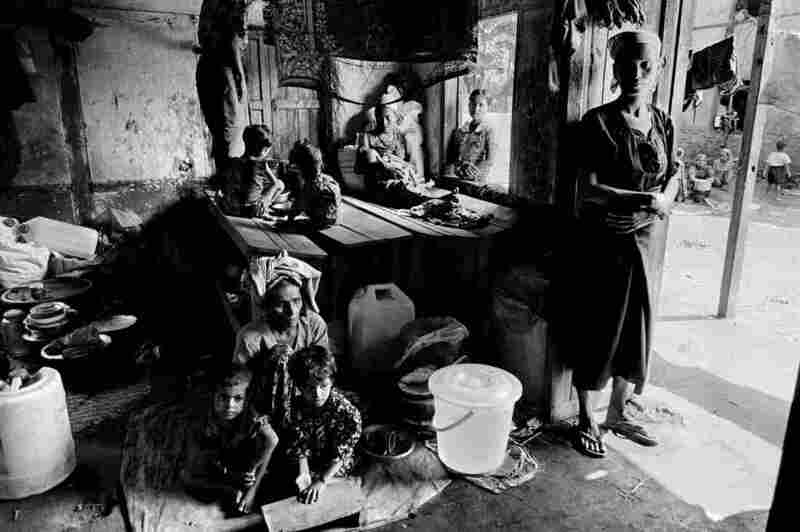 An estimated 1 million people from the Rohingya community are stateless in Myanmar. Here, 7-year-old Nur hauls mud with Rohingya men at a work site near one of the camps where they live. 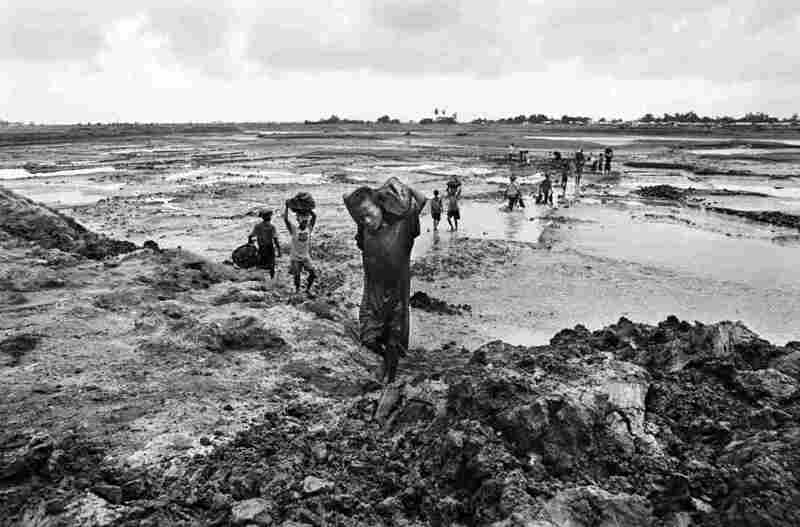 One images shows Rohingya boys hauling mud at a camp. Do these kids have a chance to go to school? Since mid-2012, Rohingya children living in the camps have not received any form of education. As a result, you have young Rohingya trying to help their families survive. 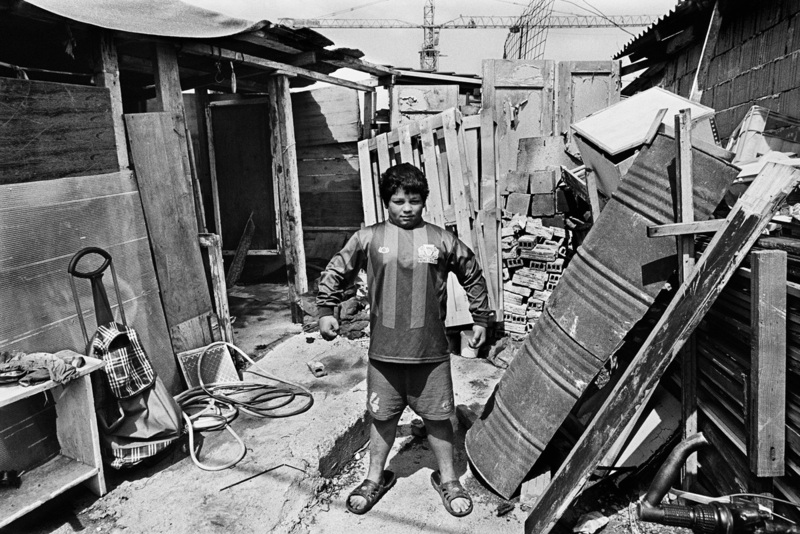 This 11-year-old boy lives with his family in a Roma settlement in Belgrade. "He and his brothers and sisters are without documents, but he had this amazing confidence," Constantine says. You've included some lighter moments – like this photo of this boy with his chest puffed out and arms flexed. I met this 11-year-old boy while I was working on a photo essay about stateless people in the Roma community living in Serbia. Most of the Roma who have difficulties with citizenship in Serbia are originally from Kosovo. Many of the children were born in Serbia but for any number of reasons, much of it discrimination and lack of birth registration, are stateless. [The boy] and his brothers and sisters are without documents, but he had this amazing confidence. He was completely aware of the situation he was in. He experienced it every day in the inability to go to school and also travel within the city freely for fear of being asked by some authority for his ID or documents. But still, he was confident his situation would change. I asked to take a few last portraits of him and that is when he puffed up his chest and flexed his arms. His determination crystallized right at that moment. 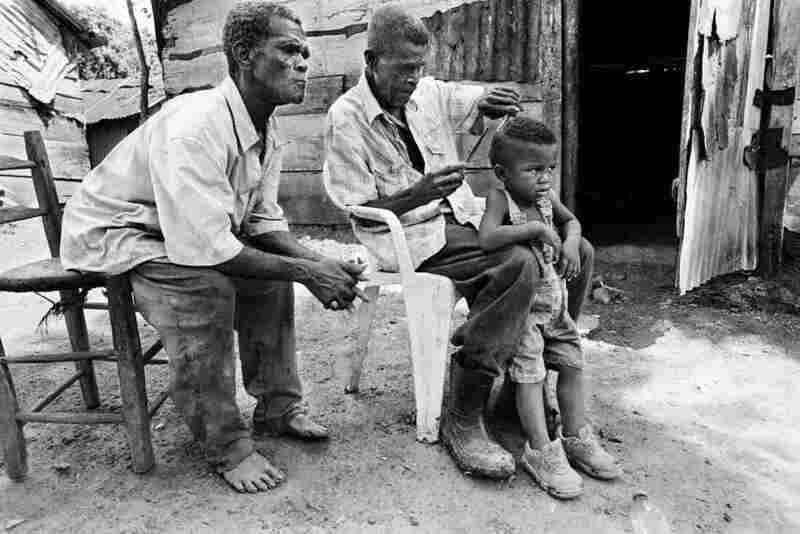 In the Dominican Republic, 92-year-old Julien cuts the hair of a 3-year-old. The boy was born in the DR but denied a birth certificate because his parents are of Haitian descent, says Constantine. What do you hope people will take away from your photos? I hope people see the photos and then have a much greater understanding of the scope of this issue and the condition stateless people live with. While stateless people are some of the most excluded people in the world, I hope the photos help people also see how incredibly determined, resourceful and talented stateless people are. They have so much to contribute to larger society and have so much potential, yet they aren't permitted to make this contribution. These hands belong to a 67-year-old man who's lived in the Dominican Republic for over 50 years — one of the thousands of people of Haitian descent who are stateless. Constantine learned that a company ID card, issued decades ago, is the man's only piece of identification. What can be done to help stateless people? The solution for statelessness is having the political will to change laws and recognize communities and open up pathways for people to become citizens and be recognized in the country where they were born. Unfortunately, there's zero political will to make those changes. Sasha (right) is an Uzbek living in Ukraine without any papers, putting him at risk of deportation. His Ukrainian wife, Nina, is determined to fight the bureaucracy to get him citizenship, Constantine says.